When you went trick-or-treating as a kid, did you scream “Halloween Apples” or “Trick-Or-Treat”? I’m pretty sure my mom used “Halloween Apples” but I grew up with the good old trick-or-treat, smell my feet song. Ha! One of my mom’s favorite sweet treats are caramel apples so I’ve named this caramel apple dip with her in mind – Halloween Apples Dip! It’s basically a homemade caramel sauce topped with your favorite Halloween candies then used as a dip for apples. A delicious but super sweet treat. You’ll have to share this one because it’s way too sweet to eat all by yourself! 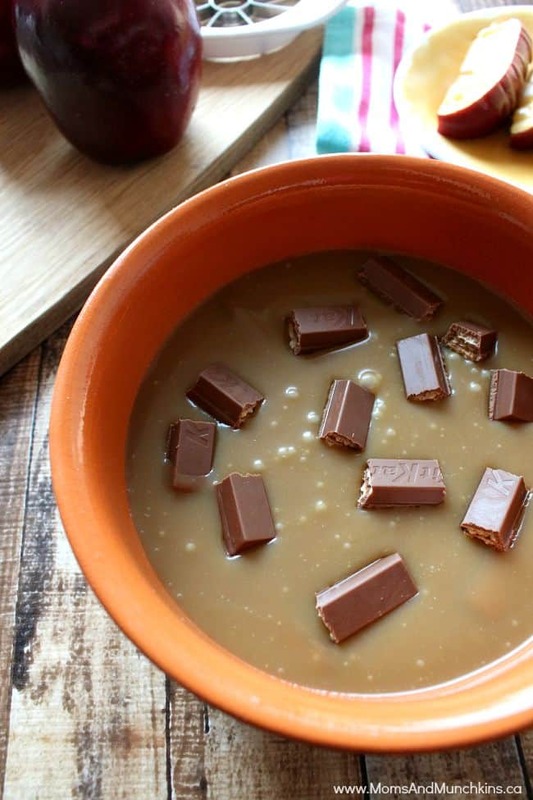 You can use any of your favorite candies in this dip. I chose some Kit Kat bars for mine but other yummy options include M&M’s, crushed nuts, toasted coconut, even mini marshmallows. The possibilities are endless! In a large saucepan, melt butter over high heat. Add heavy cream and brown sugar and mix well to mix. Bring to a boil then reduce the heat slightly and boil for 5 minutes. Remove from heat and let cool. 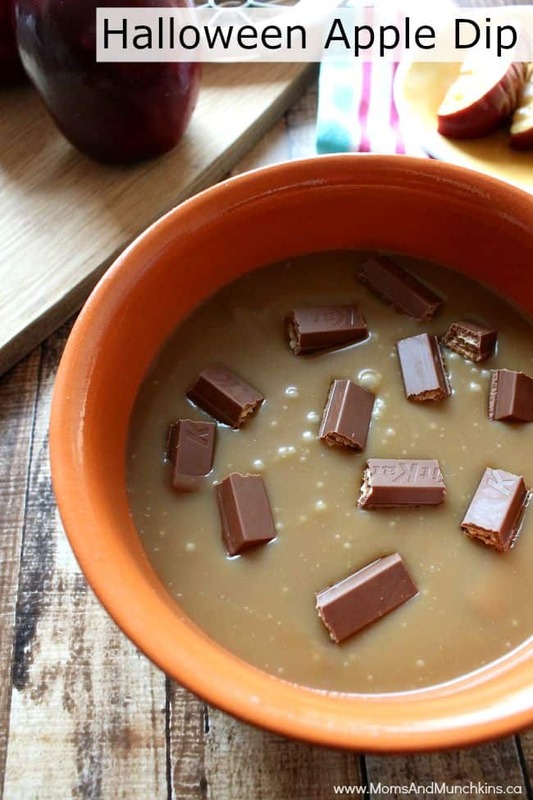 This caramel thickens as it cools and you'll want it pretty thick to use as a dip. Right before serving, sprinkle candies on top of the caramel and serve sliced apples on the side. 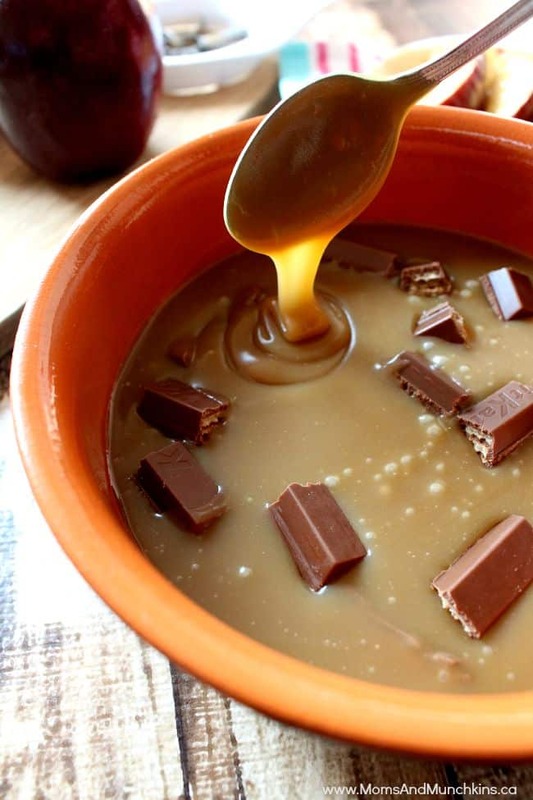 Have leftover caramel sauce? 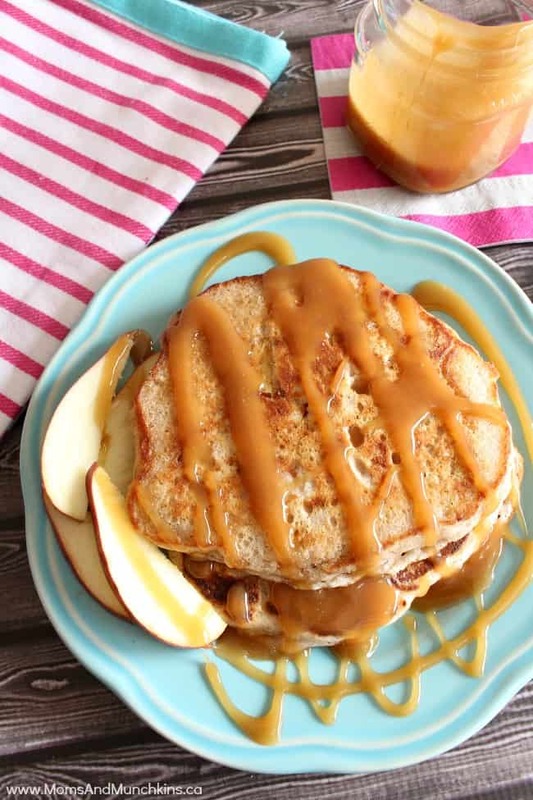 Make some of these tasty Apple Cinnamon Pancakes for breakfast with caramel syrup. Yummy! You’ll find more tasty ideas on our recipes page. We’re always adding new recipes, party ideas and more! For more Halloween ideas, visit our page dedicated to Halloween fun. Follow us on Facebook, Twitter, Pinterest, Google + and Bloglovin’ for the latest updates.